/ Best Wings in Destin FL / Landshark’s Gives You WINGS! Only .59¢ Ea. 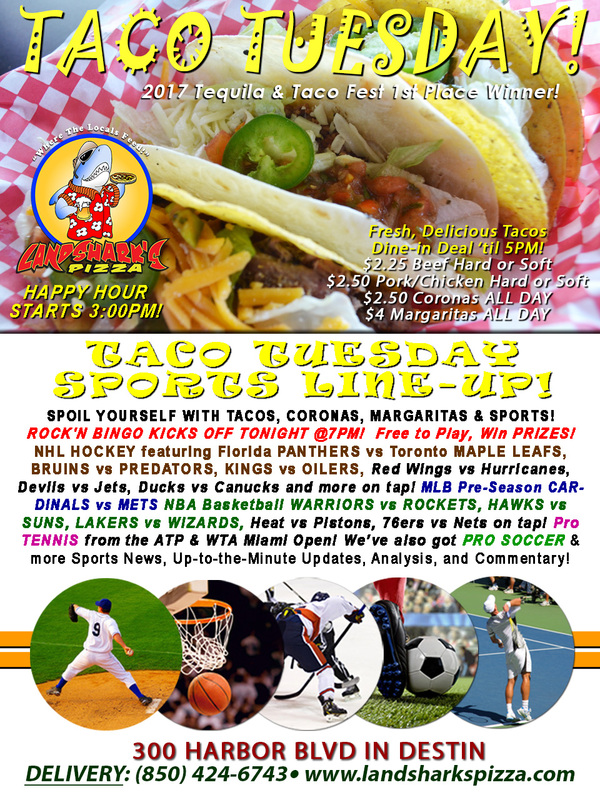 & TOP SHELF BOURBON $2 Bucks Off NHL, NBA, YANKEES vs BLUE JAYS! Landshark’s Gives You WINGS! Only .59¢ Ea. 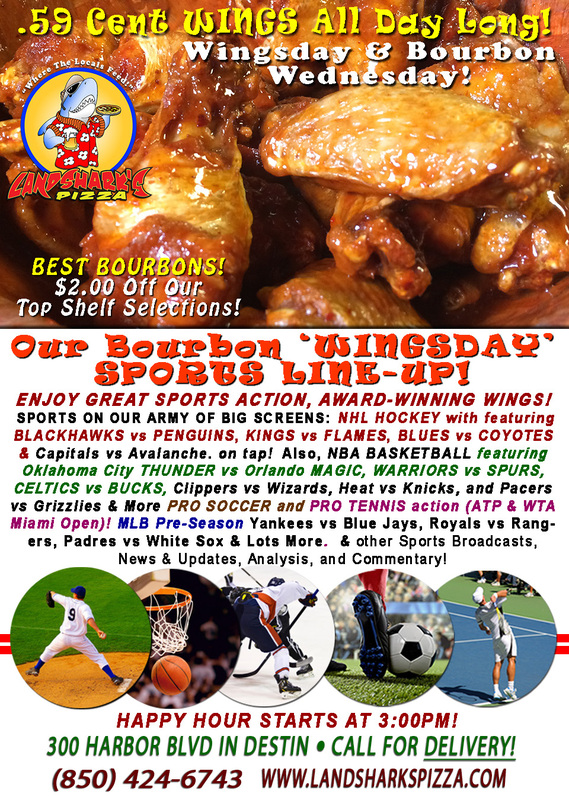 & TOP SHELF BOURBON $2 Bucks Off NHL, NBA, YANKEES vs BLUE JAYS! We’ve made it all the way to HUMPDAY – celebrate with Landshark’s delicious, crispy, juicy, & spicy to your satisfaction and only .59 Cents each ALL DAY LONG! Choose from among more than 20 sauces and rubs to compliment! 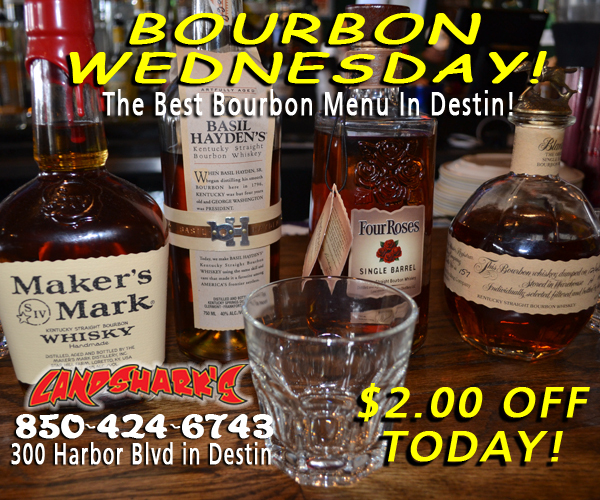 BOURBON LOVERS SPECIAL: Today, get $2.00 OFF ALL BOURBONS – even the best of the best bourbon menu in Destin! SPORTS ON OUR ARMY OF BIG SCREENS – NHL HOCKEY featuring BLACKHAWKS vs PENGUINS, KINGS vs FLAMES, BLUES vs COYOTES & Capitals vs Avalanche. NBA HOOPS with Oklahoma City THUNDER vs Orlando MAGIC, WARRIORS vs SPURS, CELTICS vs BUCKS, Clippers vs Wizards, Heat vs Knicks, and Pacers vs Grizzlies on tap! MLB Pre-Season Yankees vs Blue Jays, Royals vs Rangers, Padres vs White Sox & Lots More. Also, PRO TENNIS from the ATP & WTA Miami Open! MAJOR LEAGUE BASEBALL OPENING DAY SUNDAY APRIL 2ND! Final Four Coming Up: Saturday we’ll see #1 seed Gonzaga vs #7 Seed South Carolina & #1 Seed North Carolina vs #3 Oregon fighting to get to the National Championships Game. PGA Tour This Week: Shell Houston Open from Redstone Golf Club. Pro Tennis This Week: ATP & WTA Miami Open Continues. NASCAR This Week: Camping World Trucks Alpha Energy Solutions 250 (Saturday)|Monster Energy STP 500 (Sunday) from Martinsville Speedway. LANDSHARK’S PIZZA IN DESTIN DELIVERS & CATERS! Don’t bother getting out of bed! AMERICA IS GREAT AGAIN BECAUSE WE BRING THE AWARD-WINNING FOOD TO YOU AT HOME (or vacation condo, etc.). Delivery starts during the lunch hour BRIDGE TO BRIDGE in Destin! Give us a call at (850)424-6743 for more info! Go To Our TRIPADVISOR Page to Read Our Reviews and kindly submit yours. Easy access by simply using your Mobile Phone when you go to our website or on Facebook using the ‘Menu App’ on the left hand side under Apps. ENJOY A FULL SELECTION OF ADULT BEVERAGES and COCKTAILS – from Top Shelf Bourbons, Whiskeys and Vodkas, Scotch’s and Gins, Tequila’s and more to our Jester Series Daquiries and Margaritas. Local and Regional Brewery Beer selections, Domestic and Imports, and Wines. Previous Post: « 90s & 1-Hit Wonders ROCK’N BINGO & Award-Winning TACO TUESDAY $4 MARGARITAS & $2.50 CORONAS!